Over the years, I have read many a transwoman's account about being thrilled when they saw their lipstick smudged on a drinking glass, coffee cup, cigarette, etc. that they recently withdrew from their mouth. Am I the only one who is not thrilled by such a sight? Lipstick smudges bother me in two ways. 1. I am not a germaphobe, but when I see such lipstick smudges, even my own, it grosses me out a little bit. 2. When I see my own lipstick smudges, it means that my pristine makeup application is no longer pristine and that I must repair to the ladies' room to freshen my makeup. For that reason, I try to use a drinking straw whenever I drink. In fact, I put a fresh drinking straw in my purse whenever I go out. I prefer to use lipsticks that stay put well enough not to leave a stain. I've used only Max Factor LipFinity and Covergirl Outlast for many years because they stay so well! Even when I am at home I always use a drinking straw. I hate the idea Of my time to get everything right then have to run and apply more lipstick. 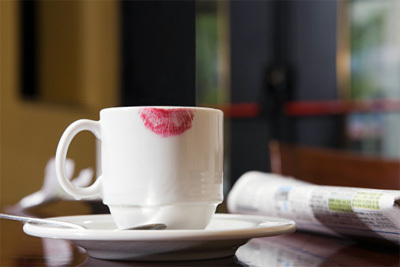 When I wear lipstick while being in drab on Sunday mornings I have to be careful how I hold a coffee cup so people don't see the lipstick smudge. I go to the powder room (men's room) to reapply it. You are brilliant! What a great idea -- to have a straw in your purse! I'm going to put a couple in my usual purse right after I submit this. Except for very dressy or formal events, I always use the same large black purse containing a pair of flats, in case I wimp out after my feet start bothering me wearing my preferred 3 inch high heel pumps. For the formal events, I carry a dainty, tiny clutch purse. The flats wouldn't fit in that, but a straw certainly would. Like the way lipstick looks, don't mind it on my lips, but yea.. I HATE when it shows up anywhere else. I used to have a real issue with it as a child, which makes it difficult when you grow to be an adult crossdresser, but I deal with it. For the first time in a long time, I was out on a breakfast date and saw a my lipstick smudge on a mug. I was so embarrassed! I felt immediately juvenile! Like, duh...BLOT!!! clear gloss and go. I quickly wiped it off with my napkin while my date read his menu. Whew! I suppose leaving a lipstick smudge is initially a step towards womanhood, but the girls here have shown me a better way... thanks you, girls! I happen to like the look of lipstick on a cup or a ciggerette. I dont smoke but when dressed I do. For me its part of the feminine experence. when I go out and drink wine I love the look of my lipstick on the glass and enjoy reapplying lipstick after I drink a glass and before I order another. Standing outside in a skirt and smoking as a women would and holding a ciggerette like women is all part of a leaning curve for me.